The Great Cookbook Experiment is not going as well as I'd hoped. I have so many lovely cookbooks, but the problem is that the recipes usually serve 6-8, and if I can't scale it down or freeze the leftovers, I won't make it. And - I love seeing other bloggers post what they eat. I'm not terribly strict with my eating - I try to enjoy a great variety of things in moderation - but some of the recipes in the cookbooks can be a little excessive, even for me. When a weight loss or healthy living blogger posts a recipe that I think looks good, I tend to hold on to it because I know it will be a little safer. Mary from A Merry Life is trying to avoid gluten and dairy, so she wanted to find a delicious creamy pasta sauce that didn't contain any milk products. 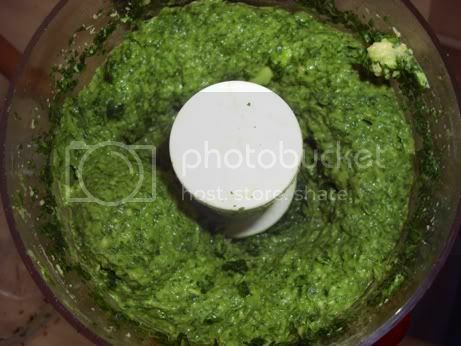 When she posted a picture and recipe for avocado spinach pasta sauce a little while ago, I knew I had to try it. It's incredibly easy to make and unbelievably delicious - the next time I see my family back home, I will be making it for them, because I think even they would like it! The recipe is sort of by the eye for this one, based on how many servings you want. 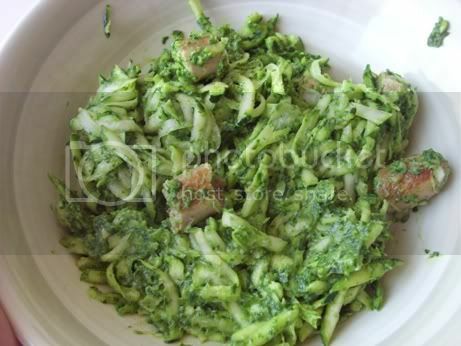 For two, you take a couple handfuls of spinach and pulse them in the food processor until they're little flakes. Then add a medium sized avocado (the riper, the better) and process until smooth and creamy. Mary also added basil and garlic to hers - I only added the garlic, and it was delicious. Since pasta is a binge trigger for me, I try not to keep it in the house - I had the last of some from an old box a couple weeks ago with asparagus and scallops, and I am not sure I could buy some right now, though I imagine this sauce would be absolutely amazing with rotini. When I want pasta, I usually have sauce with lentils ... or, lately, shredded zucchini. This time, I did the latter and added some turkey sausage ... voilà! It was incredibly filling without the heavy feeling of pasta and cream sauce - very much a spring/summer recipe, which I loved and am so ready for more of! That looks yum! Brilliantly yummy!!! Have you ever tried spaghetti squash? It might fill your pasta crave and it's not pasta! It's just veggie. How cool is that?! I agree with the above-poster. Spaghetti Squash is a go-to for me. Anyways, that sauce sounds delish, and I didn't comment a few days ago- but congrats on getting to 225. You are doing AWESOME!! I have to buy a food processor. The end. That does sound yummy. Mmm, thanks for posting. what a perfect idea. I *must* try this out. Thank you so much! Looks amazing! I need a change from my usual tomato sauce.